Dropdown slicer:When you create a normal list slicer, you can turn it into a drop down by using the dropdown option next to the Clear button. Hierarchical axis: improving the experience around viewing visuals that contain a hierarchy. You can use hierarchical labels by turning off the label concatenation experience in the formatting pane. Matrix conditional formatting You can turn on conditional formatting by opening the field well menu for the measure and selecting Conditional formatting. Table & matrix column formatting ability to format columns in tables and matrices. This lets you set the font and background color for any column. Axis label and title color control you can now format your axis title color separately from the axis labels. Mobile reports scrolling You can now extend the length of your mobile report and allow users to scroll to see the additional content. Clustering (preview): Clustering lets you quickly find groups of similar data points in a subset of your data.You can use clustering on your scatter chart by clicking the “…” and then selecting Automatically find clusters.When you select this, a dialog opens where you can decide how many clusters you want us to find. If you leave it blank, we will automatically find the number of clusters we think makes the most sense with your data. Forecasting – now available on Power BI on the web: With this release, the feature is generally available to everyone, so you no longer need to enable it through the Options dialog. Additionally, you can now see your forecasting in reports on the web and pinned tiles. Groups – ribbon entry point You can create and edit groups from the Modeling tab. You can also create a new group from the Data / Drill tab when you are on a chart. Spark DirectQuery This includes the HDInsight Spark connector (under Get Data -> Azure) as well as the Spark connector for other Spark distributions (under Get Data -> Other). OData connector – folding of expand record operations: adding support for the underlying OData Service doing the expand record operation rather than having this operation done in Power BI. 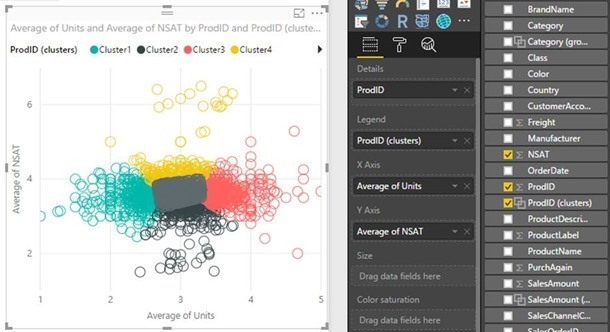 Azure Analysis Services: You can connect to Azure Analysis Services in the Power BI Desktop.To connect, select Analysis Services in the Get Data experience. Web connector updates: new datasets that leverage import from Web pages won’t be automatically configured for refresh in Power BI on the web and will require the use of a gateway. Improved “function authoring” experience: When a function definition has been created based on another query (i.e., using the “Convert to Function” option on the Queries context menu), a link will be created between the original/exemplar query and the newly generated function, so that you can simply modify the exemplar query steps and the linked function will be automatically updated for them. Maximize/Restore buttons in the Navigator and Query Dependencies dialogs: The Navigator and Query Dependencies dialogs support window resizing by dragging the bottom/right edges of the dialog.In this release it’s possible to maximize/restore these dialogs by exposing Maximize and Restore icons in the top-right corner of the dialogs so that they behave like standard Windows dialogs.